The Vikings participated in two matches the week before Holiday break. The first match was against a very good Paint Branch team on December 20th followed up two days later against the Einstein Titans. The match against the Paint Branch Panthers started off at 195 with Whitman facing a slew of upper classman and experienced wrestlers. The Vikings managed to win three of the 14 matches with pins coming from John Luke Iglesias at 220 and Peyton Casamento at 120. Max Gersch at 138 also recorded a very close victory with a 5-4 decision despite wrestling with a cut inner cheek injury that would later require stitches. The final outcome of this contest was a disappointing 15-58. The JV team fared a bit better scoring wins in five of their 15 matches. Among the winners were Zain Memon, Stephanie Solloso, Matt Cauley, Jerry Zhao and Ben Mickum. The highlight of the JV contest was provided by Ben who wrestled tough for all three periods and was able to pin his opponent with one second remaining in the third period. Well done Ben! The second contest of the week was against the Einstein Titans on December 22nd. Before the match the coaches and team captains John Luke Iglesias and Clark Boinis fired up the Vikings squad to go out and get their first win before the break. This match started out at the lowest weight class of 106 with Whitman falling behind early. After the first 10 matches the Vikings were trailing 18-33 with all 18 points collected by forfeits. Next up was 182 pound Senior Mason Austin-Brantley who pinned his opponent in the second period. Yussef Zaki at 195 followed Mason’s example with a first period pin. The score was then a manageable 30-33 with Jerry Zhao up next at 220. The Titans chose to forfeit at 220 and thus the fate of the entire contest rested with the heavyweight wrestlers. 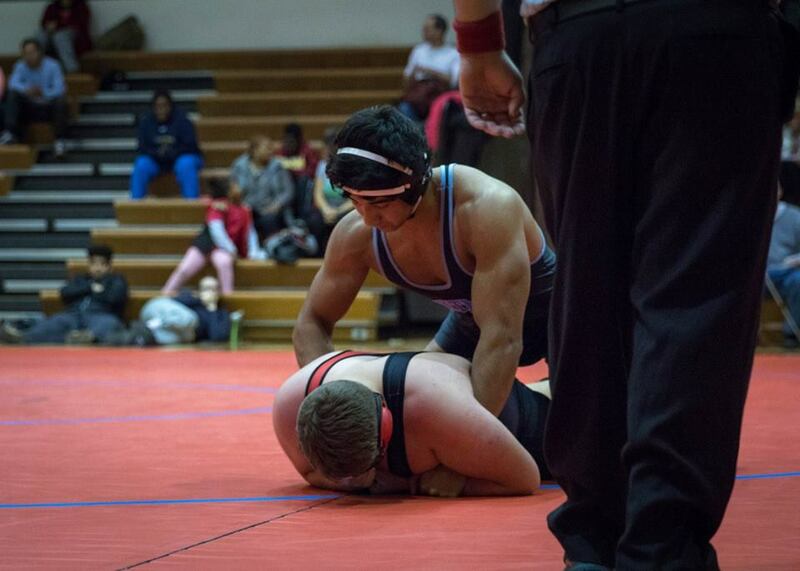 Captain John Luke Iglesias was then bumped up a weight class to try and secure Whitman’s first team victory. John Luke did not let his teammates down as he quickly put an end to the match with a dominating pin in the first 60 seconds of the first period. The final score of match was Whitman 42 and Einstein 33. The JV matches that followed were very impressive with Whitman taking all seven matches and handing the Titans a 30-0 shutout. Wins were recorded by Sebastian Turkewitz, Lucas Bravo, Matt Cauley, Jerry Zhao, Ethan Abikoff, Jack Kelly and Christian Beske with an impressive 50 second pin.